After one single bite into the plump fruit, I fell in love. I had not seen Rainier cherries before I moved to the US. Where I am from in France, we grow des cerises noires (black cherries) and des cerises aigres (sour cherries) , delicious and juicy, especially those I am able to pick and eat right from the cherry trees. But Rainier cherries have a je-ne-sais-quoi that takes any variety of cherries a step up. They are sweeter and with their yellow orange hue, seem to be smiling and beaming like the sunshine at sunset. I remember that when my father and I talked over the phone one Sunday sometime in June, he had told me that their cherry trees were so heavy with fruit that every day during an entire week, he filled buckets with delicious overly ripe fruit, which incidentally made every neighbor and friend stopping by happy as he gave the buckets away. C’est une année à fruits (It’s a good year for fruit), he had carried on, explaining at length how they were going to use the fruit. My father likes to talk about those things too. My parents worked as a team: while my father was busy with the picking, my mother made jams and filled bags for the freezer. Then, she used the leftovers in clafoutis and tarts. “Il y aura encore des cerises et des groseilles quand on vient ?” (Will there still be cherries and red currants when we come?) I eagerly asked when, a few weeks later, we chit chatted about this and that as we were — are — getting ready for our upcoming stay with them. They knew well that I was going to be disappointed to hear that. This time of year is so special! I’m sure you know that Rainier cherries come from Washington State, and are a cross between the Bing and Van varieties. Since these jewels have appeared in my local store, I never seem to have enough of them. In fact, every time I buy a bag, I have a plan to cook something cute and scrumptious with them, but they rarely seem to make it into a dish. Instead, we love to eat them nature. I like to wash a few handfuls and keep them in a bowl on the kitchen island. I look at them and they make me smile. They are a favorite snack every time I walk by — and I’d walk around with pits in my mouth. At other times, P. and I enjoy them in a fruit plate after dinner, with a little cane sugar sprinkled on top, and a large bowl of sheep plain yogurt and homemade granola on the side. It’s nice and simple but so rewarding. 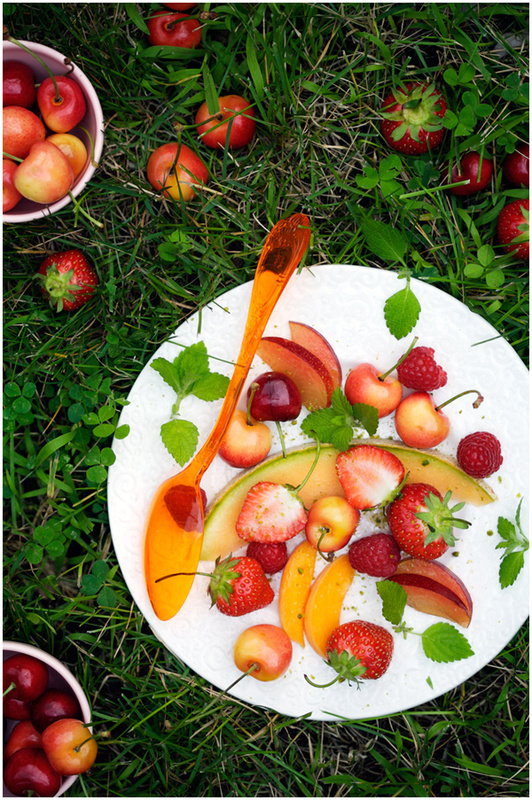 It makes us rejoice in summer, especially if we are able to eat sitting outside, with the grass brushing against our feet, and nothing to worry about but enjoy the moment — and the fruit. But on some days, these summer fruit really inspire me to prepare a more elaborate dessert or a salad. My first idea was to bake a fruit crumble. P. and I really love crumbles! Do you too? A crumble is one of many comforting everyday desserts so easy to make, one that always seems to welcome any seasonal fruit wonderfully. It does not matter whether the fruit isn’t the prettiest; it’s always going to be tasty in a crumble. In this recipe for example, I combined Rainier cherries and red and white currants and I tossed them in cane sugar and lime juice. Then, I topped the fruit with a mixture made with almond meal, quinoa flour, butter, brown sugar and a generous amount of nuts. With the sweetness of the cherries balancing the tarter taste of the currants, the dessert bursted with flavor. I think that like P. and I, you’ll fall in love with it! 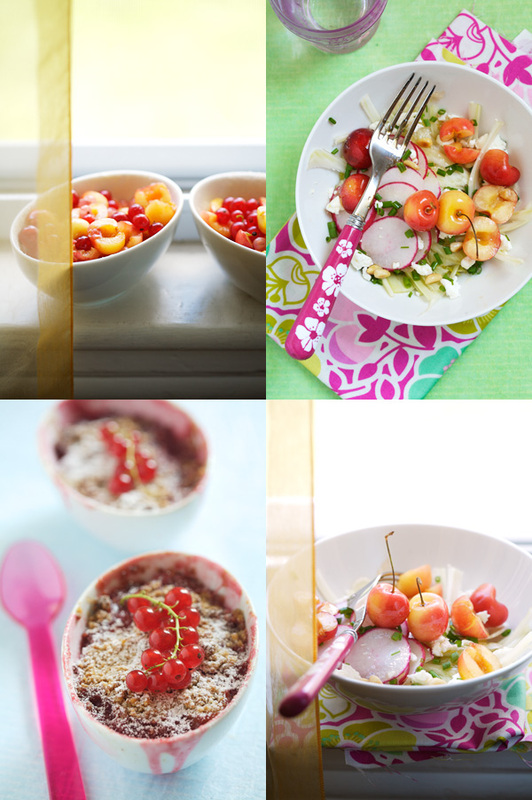 Then on that same day, as I was about to prepare my lunch, I thought about adding Rainier cherries in a crunchy fennel and radish salad. I completed the dish with my favorite soft goat cheese and freshly chopped chives picked in the garden. It was delicious and refreshing, so much so that I made more to accompany our dinner the next day. A recipe that is a real keeper. And when I was done with my bag of cherries and boxes of currants, I walked to the store to buy more. I am sure that you’ve already noticed that I am just addicted. It shows and I cannot help it. You will probably have leftovers of the crumble topping. Freeze it and keep it handy for future uses. You’ll be thankful for leftovers. In the bowl of a stand mixer, combine the flours, almond meal, sugar and nuts. Add the sugar and then the butter. Pulse to obtain coarse crumbles. In a bowl, combine the fruit ingredients; set aside. Butter 4 ramekins and coat with sugar. Divide the fruit between the ramekins and top with the crumble. Bake for 30 to 35 minutes, or until the fruit is bubbly and the top is golden brown in color. Let cool for 10 to 15 minutes before serving. Dust with confectioner’s sugar. In a non-stick frying pan, roast the pine nuts on medium heat until fragrant and lightly brown; set aside. In a bowl, combine the fennel, radish, goat cheese and cherries. Season with salt and pepper and drizzle generously with lime juice (or lemon) and olive oil. Add the chives and pine nuts, and toss before serving. There have been cherries everywhere. So sweet and yummy. Decadently delicious desserts! 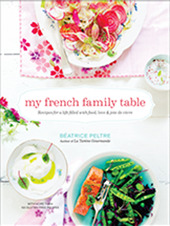 I was wondering if you could perhaps list a couple of your must have cookbooks and magazines. I’ve been bitten by the cooking bug and would love some reading material. I’m trying to eat as many berries as I can before they go out of season. They all have such rewarding health benefits! We just picked up some of these beauties at last weekend’s farmer’s market in the Bucktown neighborhood of Chicago… they were gone within 1 day. They are much loved in our home and we are looking forward to picking up some more this weekend! I love the photos in the grass!! and this is a prettylooking berry crumble! Je finis de lire le message et je pousse un long soupir… de bonheur. 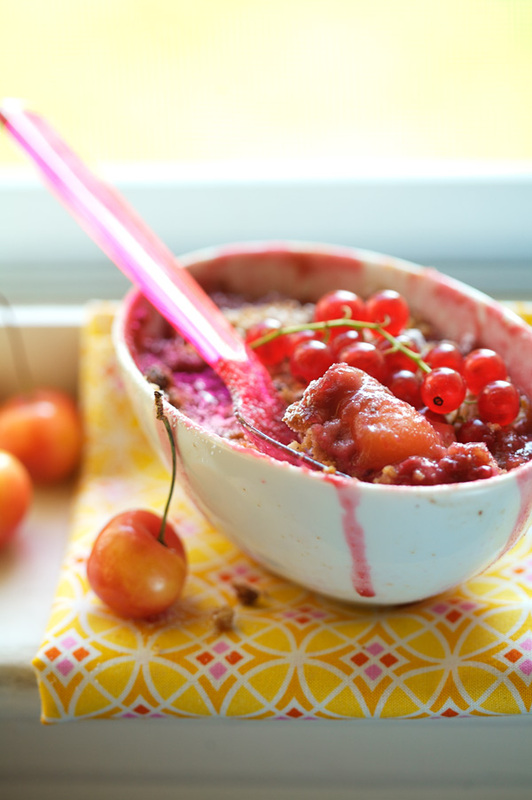 Je ne sais pas si ce sont les cerises, la beauté des photos, toute cette lumière, l’idée d’un crumble, mais tout semble parfait! this cherries look very tasty… and funny indeed! summer fruits makes me happy, ’cause it’s sunny and coloured and sciented… thanks for sharing this deep and serious addiction!!! We have a very similar to Rainier cheries variety here in Greece, it might be exactly tha same actually! We call them “petrokerasa” (“stone-cheries”), because they are more “crispy” that the other varieties, and we eat them nature or bring them into confit, which is great with yogurt or vanilla ice cream and on cheesecakes. Your photos are beautiful! Oh. I am aware. !!! I WILL be trying that yummy salad later. And was cooing over the fact that the City Super here in Hong Kong had Washington Cherries, Driscoll’s raspberries, blueberries, and strawberries. I’ve been spending inordinate amounts on those fruits, but…oh, I’m missing home (US) fruits! ah the salad! that i will definitely have to try. beautiful images full of light. gorgeous post bea! I know these cherries from Germany and they are indeed a very nice treat. I love all your pictures by the way, they always make my mouth water. I’ve been seeing Rainier cherries all around me lately and was thinking what to do with them besides eating them straight up. this crumble looks thoroughly addictive! Love that adorable fork with the mod-floral design. Depuis que je les ai découvertes, j’adore aussi les cerises Rainier, elles sont vraiment délicieuses. Je craque aussi pour ton crumble qui devrait être dégusté très bientôt chez moi. Rainers have just come into my market this week. Now I know what I will be making with them! Thanks! J’ai aussi du mal à utiliser les fruits dans des préparations: ils sont tellement bons tout seuls! Mais cette salade m’a l’air vraiment tentante: je n’aurais jamais pensé mettre des cerises avec du chèvre! Great photos! The stones fruits are so plentiful this year, yes? We have Flathead cherries in my part of the world. Delicious! Just finished my last Rainier and off to the store for more.I just knew I didn’t buy enough on the first try today. We’ll have the crumble on Sunday! …”smiling and beaming like the sunshine at sunset.”…the perfect words. Though I love Rainier cherries as well, I was just in Paris and had my first taste of those black cherries mentioned – heavens, I was hooked. I walked around the city with a black-stained mouth and teeth for 5 days. I’ve certainly been eating my sharea of rainier cherries! Very nice photographs! Oh yes, Rainier cherries are one of our state’s greatest contributions to the food world! You may notice that they are more red than usual this year – it’s because of all the sunny weather we have been having in the Northwest. I think they taste better than ever! I adore Rainier cherries, too. And I, too, did not know of them until I moved in the US. They are delicious indeed and mine never get cooked, but these recipes for the crumble, and ESPECIALLY the salad look amazing! Beautiful! Bea, every one of your beautiful posts makes me want to run to my stove and start cooking. The almond crumble looks fantastic – and the currants you have in your photos just make my mouth water. I may need to take a shopping trip for some cherries today! Thank you for another beautiful post. Your beautiful pictures combined with lovely prose has inspired me to buy Ranier cherries *today*…or made me fully jealous of said cherries, and has forced my hand into giving up and giving into them, no matter the price. Which ever, I’d say these beautiful, multicolored fruits are in my future. Thank you. Great combinations. I typically would only think of fairly standard desserts for cherries, e.g. crumble, Black Forest cake-esque flavours, and slices. But I love the savoury spin. Delicious! I love Rainier the best too! They are so sweet and happy looking. I moved to Washington state from the south (Louisiana) where we don’t grow cherries. I don’t even remember seeing them in stores until recent years. The first time I ever ate a fresh cherry was in France! I was visiting Mont -Ste-Michel and we bought some fruit in a nearby town to eat while there…I still remember that new taste sensation. I’ve been hooked ever since! I agree with your dad : it’s a great year for fruits ! 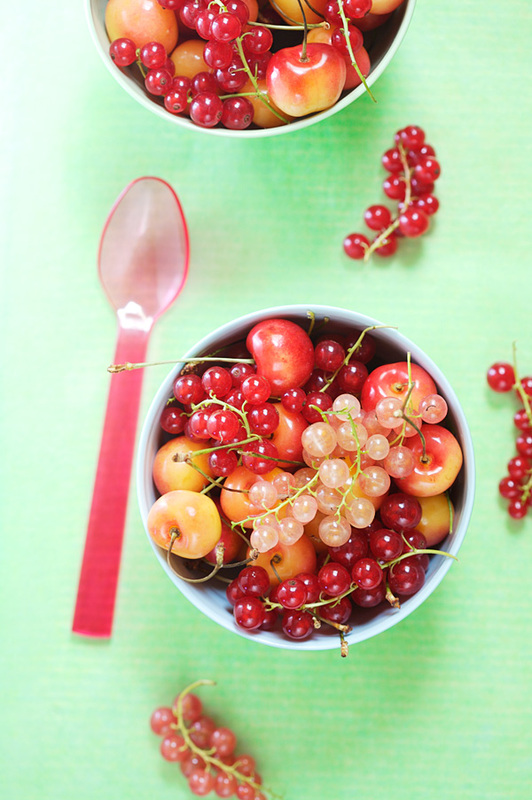 I had tons of blackcurrant and redcurrant but your Rainier cherries are so cute, love their color ! The crumble looks absolutely delicious ! PS : I’m crazy about your plastic cutlery (the orange spoon, the grey fork…) where did you find it ??? Have you cooked rabbit with a cherry and red wine sauce? We’ve had tons of cherries here in Saint-Aignan-sur-Cher, so we’ve had to be creative in using them. Cerises à l’alcool, clafoutis, confitures, canard aux cerises, lapin aux cerises, tartes aux cerises… et puis ça nous arrive de les manger comme ça, sans faire des chichis. Oh I love these pictures, they are so divine. I just went cherry picking out in WA, the trees are just full of them. They are so beautiful and delicious. I can’t wait to try those recipes. They look scrumptious! splendid color~ so yummy ! The salad sounds divine! Love the photo of the cherries in the window. Thanks for explaining where these rainier cherries come from! I had seen them before and was wondering why I could never find them here, but now I know… Probably not to be found in this part of the world! Fabulous photos and that crumble looks delicious! I just ate a whole bag of Rainier cherries. My faavorite~! What a great blog! I would love to add one another as followers. Just our trying to network with other creative souls, artists, and designers! I’m not entirely sure, but I think that’s the type of cherry tree my parents have. Unfortunately, most of the fruit is eaten by wildlife (neighbourhood children included). On dirait le même thème que chez Aran? Thanks for the recipe ideas. I never know what to do with them! I always stayed away from the Rainier Cherries because I did not think hey would be good and then one day I tried one – wonderful. These are great recipes and beautiful as always! All the photos are just so vibrant and stunning. I also now have a huge craving for these delicious cherries! Those currants in the first photo are just the most beautiful things! I had never thought to make a crumble with cherries for some reason, but I heartily endorse the cherry and goat cheese combo! I had never tried Rainier Cherries before this year. They are so incredibly delicious. I must try the crumble it looks delighful! I wondered if Rainier cherries made there way across the states! I’m in Seattle. Thank you for a great crumble recipe idea – I’m eager to try it – I haven’t used quinoa flour yet. I just made a cherry pie with Washington cherries – a mix of Bing and Rainier (and um, some other assorted fruit for good measure). Have a great summer! i’m in the seattle area too…and we do love our rainier cherries! 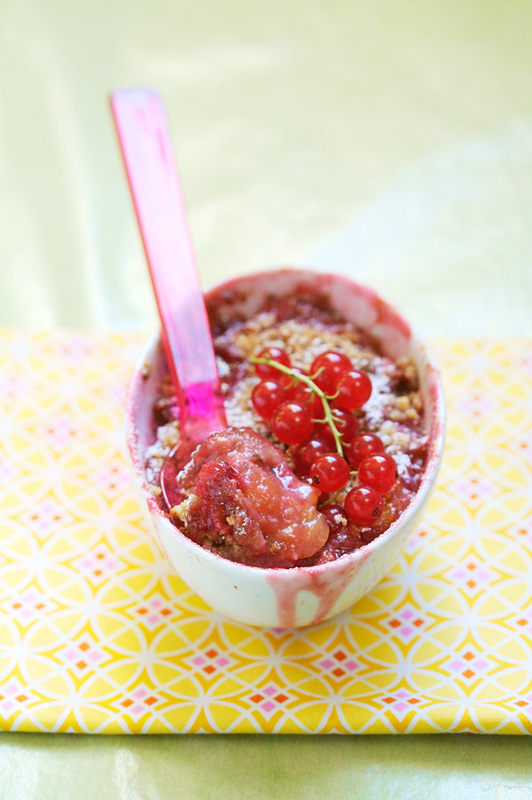 your crumble sounds and looks just perfect for these special, special cherries! The cherries are so colorful and lit so beautifully. you should visit seattle in July! There are always 5 different varieties of cherries at the farmer’s market, the raniers have just hit their peak. Had some attikas this weekend that were a beautiful dark purple, sweet, and popped in your mouth. Thank you everyone. I promise to be back soon with more…. Your photos are really great! Things seems so tasty! My spoon nearly tried to reached out some of your little crumble! Bonjour! i’m so in love with ur pictures! Loved this post! It’s so wonderful to see the joy that a seemingly simple fruit can bring! And I love all the uses for Rainier cherries although they are perfect to eat plain too. 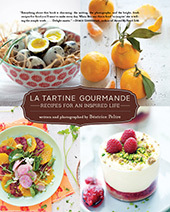 I enjoyed the lovely pictures and absolutely must try making the fruit crumble. Have you thought about setting up a http://www.proprofs.com/polls/ poll for your readers? I find them helpful also fun for voting! In this magnificent cherry season, I think it just to note the passing of a very special man. Never heard of him, you say? Well, get down on your knees, point yourself toward Washington state, and get ready to express your deepest gratitude in any way that is meaningful to you. In 1952, at age 31 while working at the University of Washington, Harold Fogle cross-pollinated the Van and Bing cherries. The result? So bless you, bless you Dr. Fogle, for your exquisite gift to humanity (and to birds, who regularly ate all of our Rainiers despite the best pan-banging efforts of a certain six-year old). Rest in peace. We adore these, too! Trader Joe’s sometimes has the dried ones, which we scoop up we see them, and send them a loved one who is a Marine, currently in Afghanistan. Like you said- c’est mieux que rien! My friends just returned from eastern Washington (state), ground zero for Rainer cherry orchards. They dropped by yesterday with fresh-picked Rainiers the size of apricots. Your post has truly done justice to this fine fruit. I grow them here in western WA, but those grown east of the Cascades are unmatched, coddled with bright sun and irrigation from the Columbia River. Thanks for the recipes, that is if any make it out of my hand. Comme toi, j’adore les cerises Rainier mais je les aime trop pour les cuisiner. Par contre, j’aime bien les fruits dans une salade pour le petit goût acide qu’ils apportent.